The 2017 Laws of Contract Bridge were approved by the WBF in March, 2017. Under Law 80A3, the ABF, may either delegate or assign its regulatory powers to another entity. The ABF has approved a new assignment to States and Territories to come into effect on 1 August 2017 and extended for five years from that date. In January 2009 the WBF adopted a new set of Anti-Doping Rules under the revised (2009) World Anti-Doping Code (the “Code”). These rules are available on the WBF website at www.worldbridge.org/rules-regulations/anti-doping-regulations/. As a result of a survey taken in Lille it has become apparent that some players may have been taking medications which actually are included in the WADA prohibited list. Further information from the WBF is provided in the document below. In line with its obligations under these rules the Australian Bridge Federation draws the attention of its international players to their obligations under these rules. be aware of the document below and have accepted and agreed to abide by its contents. The 2007 Laws of Duplicate Bridge provide for the Regulating Authority (c.f. 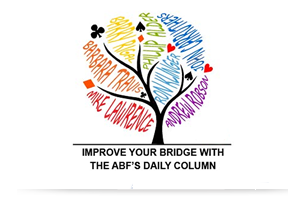 the ABF/NZ Bridge) to select certain Law options and to regulate their usage within its geographical region. Regulating Authorities are further permitted to provide regional interpretation and guidance as to the application of such options and regulations.